We just learned about the Adnexa, things that stick out of your skin. Part of the Adnexa is Hair. 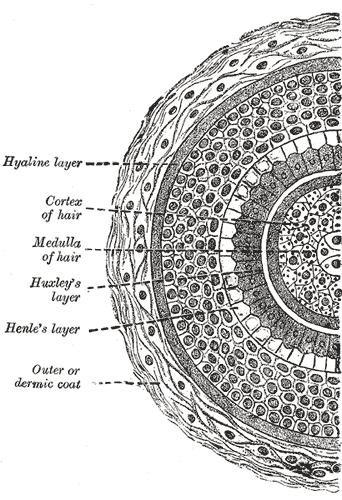 Even though hair just looks like small strings to us, there are a lot of parts to hair like the root, the follicle, shaft, cuticle, cortex and medulla. Hair can be curly or straight, and can be many colors like brown, black, blond, red or even white. It grows on every part of the skin except places like the palms, bottoms of the feet, and lips.